Euch! Who left the dragon out in the hot sun? Now it’s all melty. Now, I would think that such issues would have come out on the first date. ‘a novel of the embossed edge’ instead of the serrated edge! Love it! Dunno about SerrATed Edge… it just looks like the bottom corner’s been nibbled a bit. Background music worthy O Bounteous Baen. In all the shininess, the fact that the horse-headed dragon in back seems to have been warped by a space-time anomaly goes unnoticed. Also available as a Serra Ted Talk. @Fred: that’s certainly a cheesy enough song but the sheer 1987-ness of this cover (from, er, 1994) needs something that smells of hair-gel and with linn-drums and really squeaky synths. 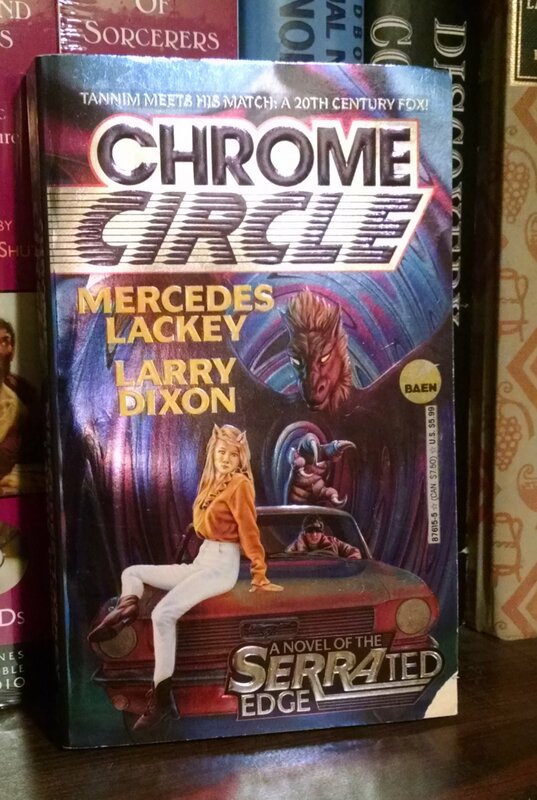 @Bibliomancer(4): How come a Mercedes lackey is spruiking Ford Mustang? Judging by the cover, this one should be named Rust Bucket. Ser Ra Ted Edge? What is this, GoT? Was the blurb originally ‘Tannim meets his match in an RKO Radio’?